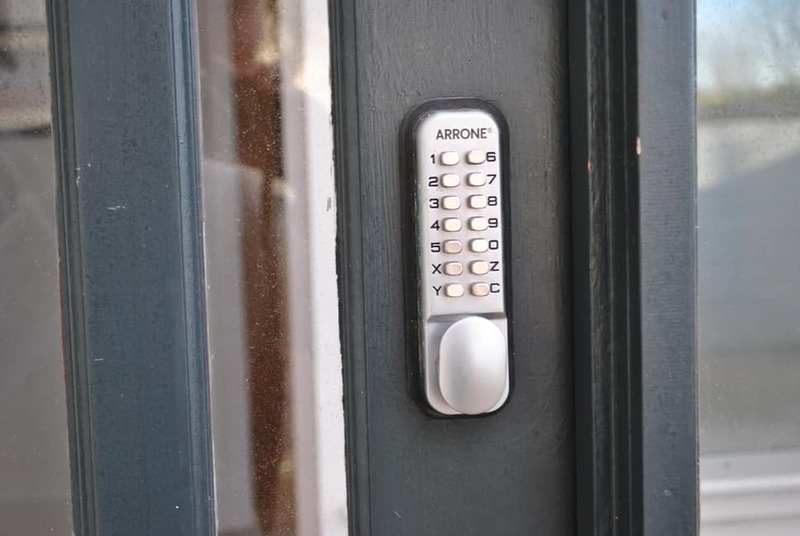 This access guide does not contain opinions as to our suitability for those with access needs, but aims to describe the facilities and services we offer to all our guests. 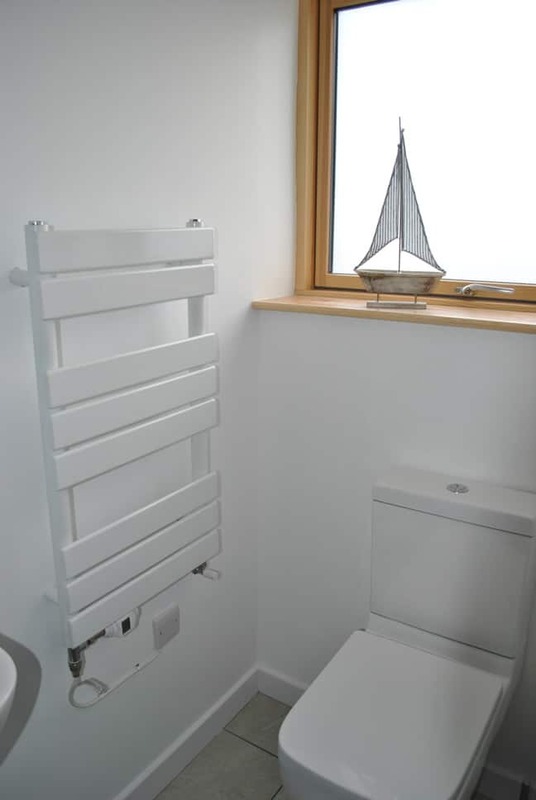 We would like to be as helpful – but also as accurate – as possible, so we should note from the start that unfortunately our doors are not to standard wheelchair access widths and our bathrooms do not have support handrails. 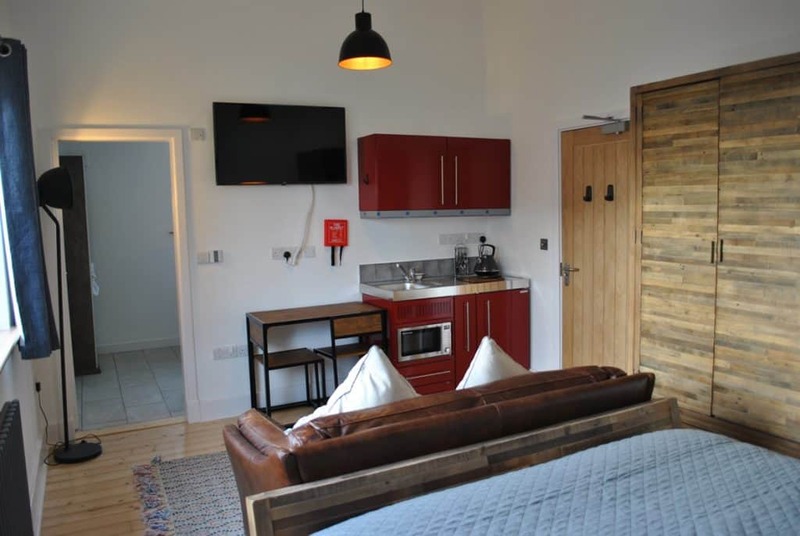 We hope the detailed description below helps you decide if our accommodation is suitable for you, but if you have any questions at all, please feel free to get in touch. 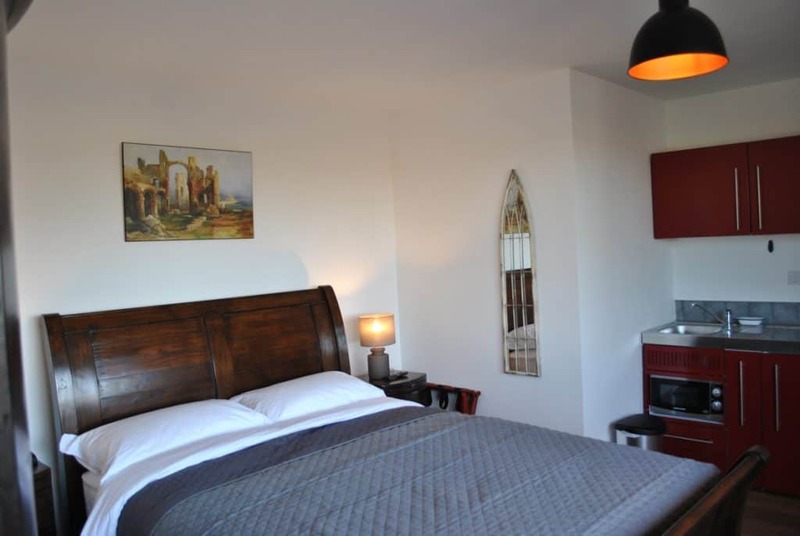 Belvue Guesthouse Holy Island has three guest rooms. Two have basic cooking facilities. Breakfast is not provided, although there are several breakfast options nearby. We would like all our guests to feel welcome, and to enjoy the spectacular experience of staying ‘on island’, without having to leave when the tide approaches. Our philosophy is to respect our guests’ privacy and leave them in peace in our luxury rooms once they are checked in (as opposed to a more traditional approach of making guests feel they are in someone’s house). However, if you have any questions, or you think you might require assistance, please feel welcome to discuss this with us. We are a small guesthouse operated by a couple (and at times one of us), but we will do our best to help you as much as we can. Holy Island is reachable via a causeway, which is a normal road during low tide, but impassable when the tide comes in. We have a written a detailed article about how to cross the causeway safely. Once you are on the Island, we are the seventh house on your left after you pass the main car park. It is clearly signed as ‘BELVUE’. A location map of the property is provided on our website. With the exception of taxis from Berwick-upon-Tweed train station, public transport to Holy Island is not frequent or straightforward. Our website provides an article about your public transport options. 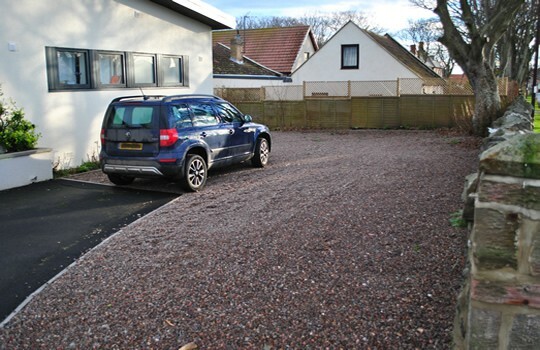 Parking area at front of house. 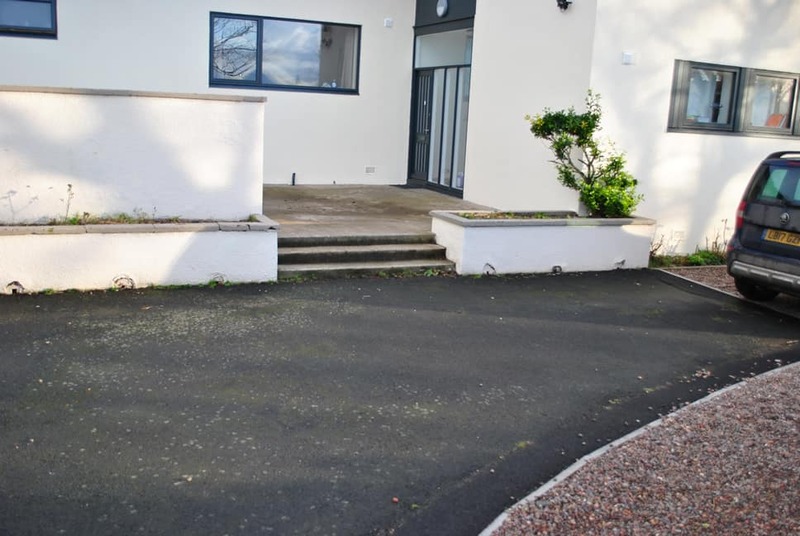 From the car park to the front of the house there are three steps and then one further step at the threshold. 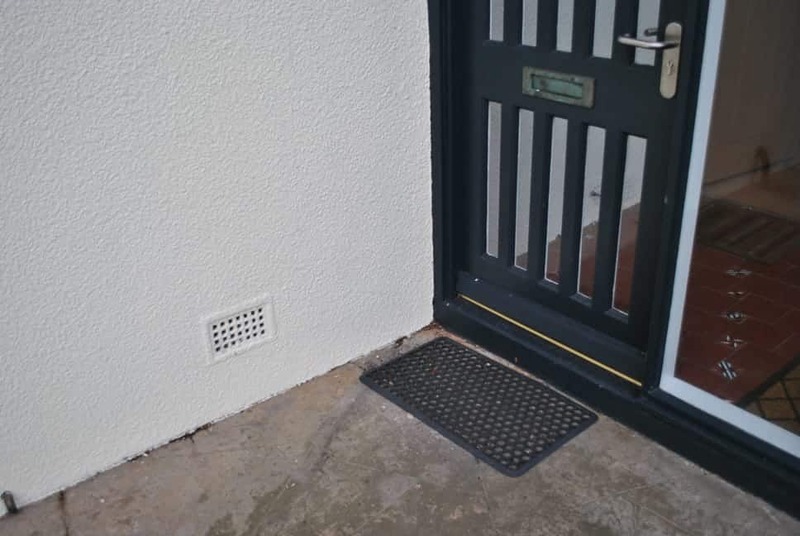 The width of the front door is 79cm and the porch door is 76cm width with a clearance of 73cm. We will normally greet our guests and check them in. Thereafter, access to the property is through a door locked by a code latch (pictured). Code latch at front of house. Guests will be provided with the entry code. 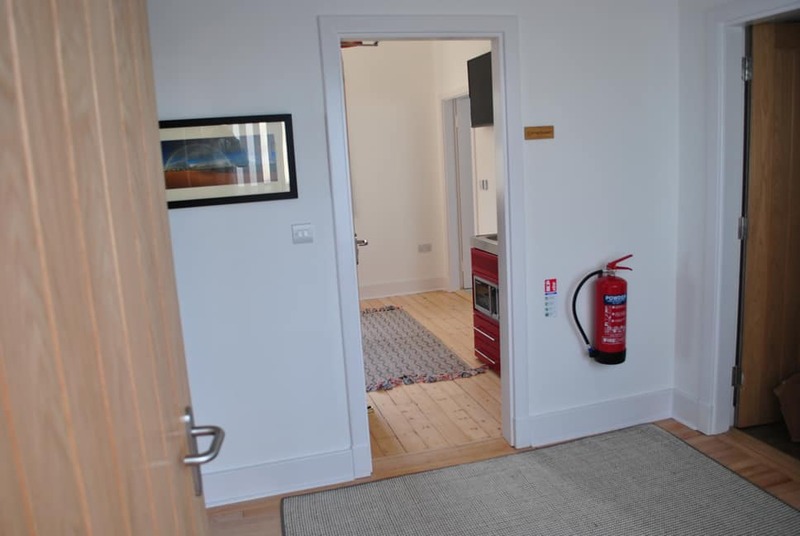 From the porch to the door of the Pilgrim Room (twin) and the Reiver Studio there is a small entrance hall with a level wooden floor, partly covered by a rug. There are no internal steps on the way to either of these rooms. To get to the door of the Abbot Studio there are four steps to climb. This room has a king size bed, a wardrobe, a two-seater sofa, a 43 inch flat screen TV, a breakfast table and kitchenette (see pictures for details). There is an en suite with shower enclosure, comfort-height toilet and a sink. The door to this room is 70cm wide and opens inwards. As this is a fire door, it does provide some resistance when being opened. The door to the bathroom is 70cm wide. Clearance by the side of the bed is 55cm to the left and 55cm to the right. The bedroom floors are wood throughout with rugs in places. The bathroom floor is tiled with timer-operated underfloor heating. 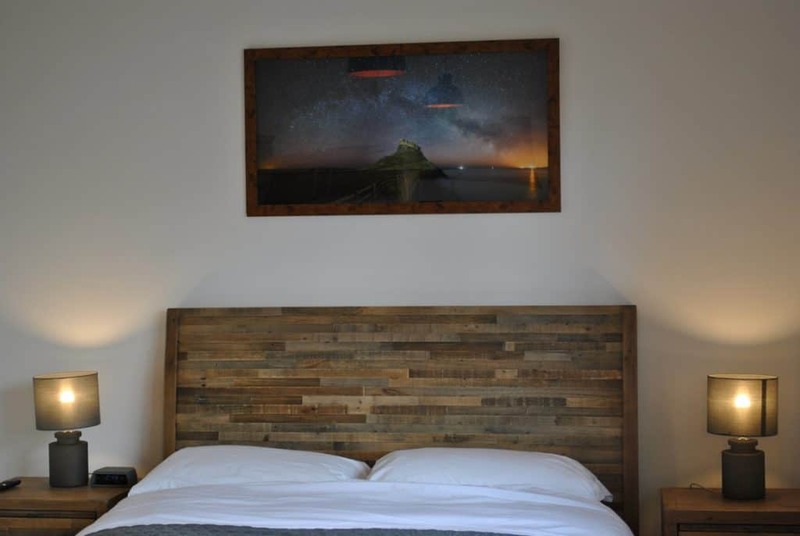 There are bedside tables either side of the bed with an LED alarm clock and bedside lamps. The main room ceiling lights are operated via a dimmer switch at the entrance to the room and a bedside switch. There is a suitcase rack, iron and ironing board, hair dryer. The TV is wall mounted, operated via remote control. There is a cordless kettle, toaster, microwave, fridge. In the higher kitchenette cupboard there are plates, bowels mugs, glasses and cutlery. The height of the kitchenette is 90cm, the higher cupboard shelves are at 150cm and 175cm height. Heating in the room is controlled by a timed smart control that can be adjusted by guests at the radiator valve. Pillows and duvets are synthetic non-allergen. Sheets, duvet-covers and pillow cases are cotton. 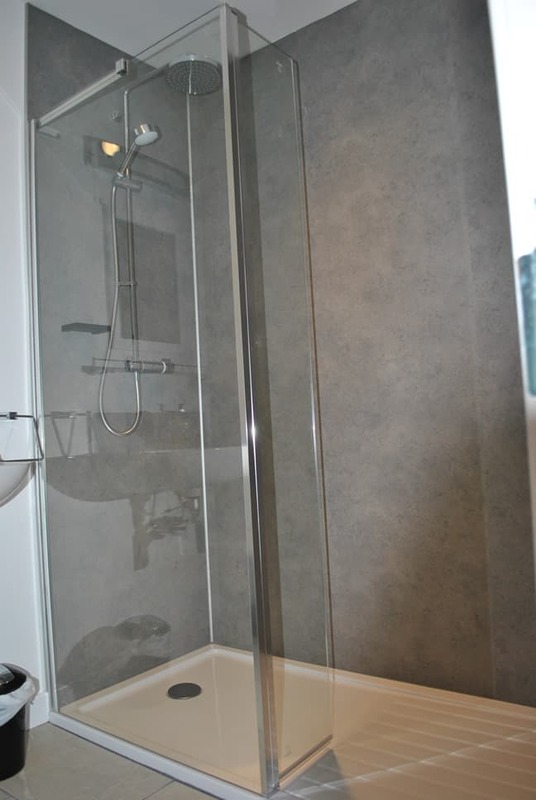 Entrance to the shower enclosure is via a sliding door. The shower tray has a 9cm step-over frame up from the tiled bathroom floor. The shower is operated through a thermostatic mixer and includes a fixed showerhead and a separate handheld spray showerhead. There are no support handrails in the shower enclosure. We have a shower chair available to guests upon request. The toilet in this bathroom is ‘comfort height’ (48cm). This room is on the elevated level of the building, so there are four steps from the entrance hall to the second landing where the room’s entrance is. This room has a king size bed, a wardrobe, a 43 inch flat screen TV, a breakfast table and kitchenette (see pictures for details). 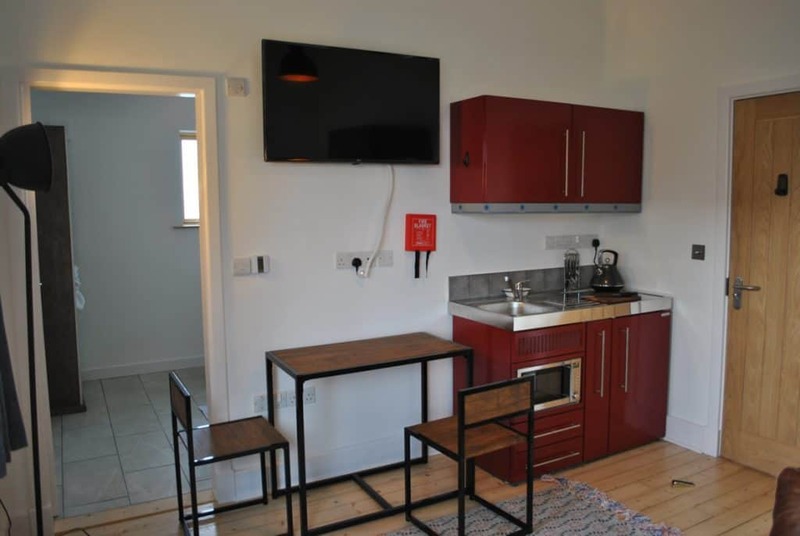 There is an en suite with walk-in shower enclosure, comfort-height toilet and a sink. The door to this room is 72cm wide and opens outwards. As this is a fire door, it does provide some resistance when being opened. The door to the bathroom is 72cm wide with a clearance of 69cm. Clearance by the side of the bed is 55cm to the left and 70cm to the right. The main room ceiling light is operated via a dimmer switch at the entrance to the room and a bedside switch. 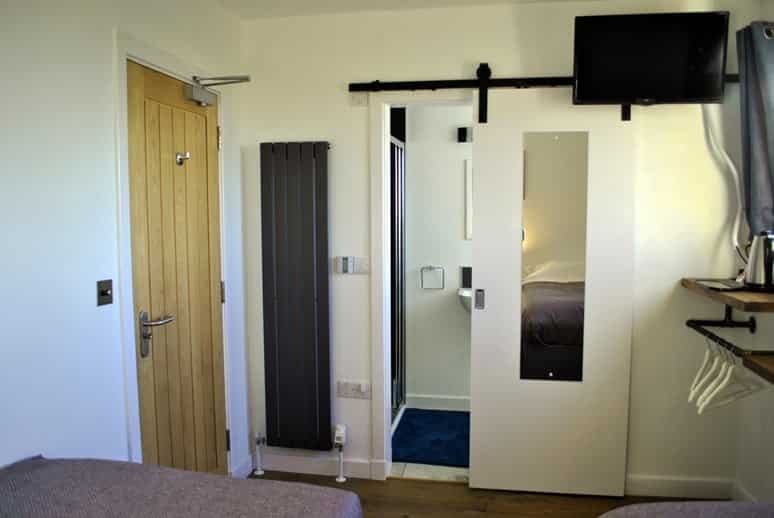 The TV is wall mounted on a rotating, fully retractable arm. The TV is operated via remote control. There are no support handrails in the enclosure. The shower tray is a 4cm step from the tiled bathroom floor. See enclosed pictures for full room details. 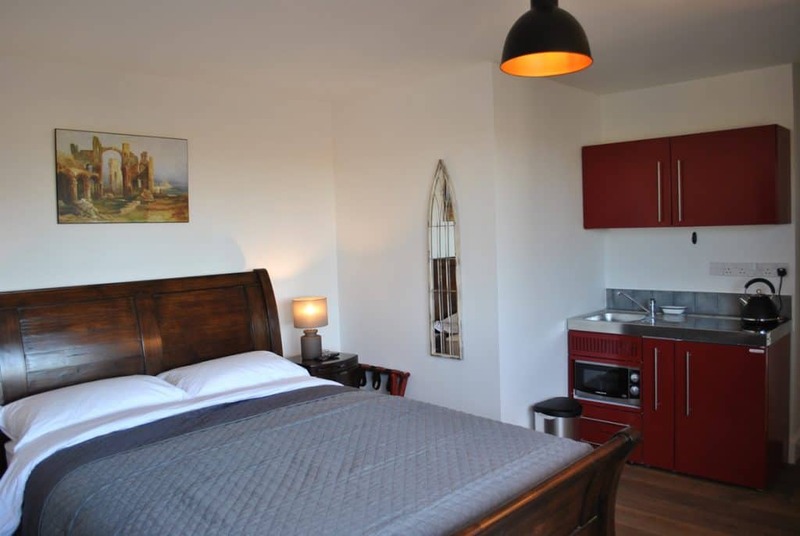 This room has two single beds, a TV, coffee making facilities and an en suite with shower enclosure, sink and WC. Both the room and the bathroom are relatively small (and hence ‘no frills’). The room is 2.47m by 3.5m. The door to this room is 68 cm wide and opens inwards. As this is a fire door, it does provide some resistance when being opened. The door to the bathroom is 63cm wide and is a sliding door. 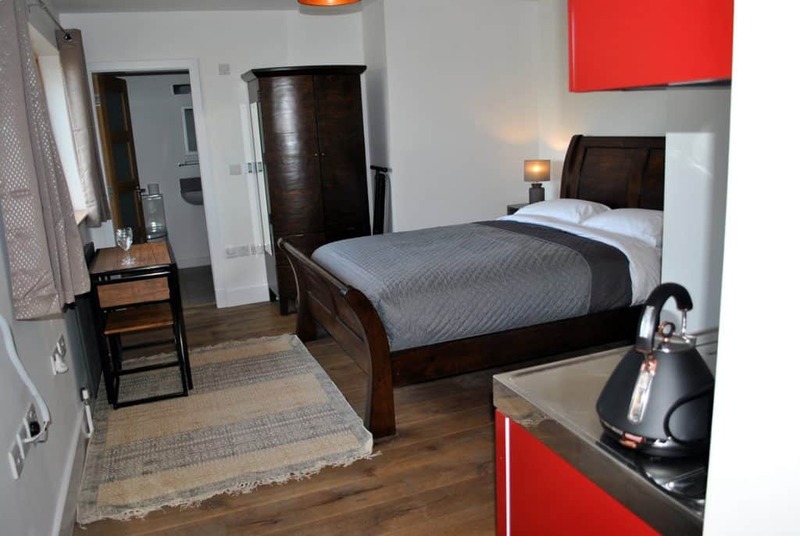 Access to the single beds is through the centre of the room. The gap between beds is 63 cm. 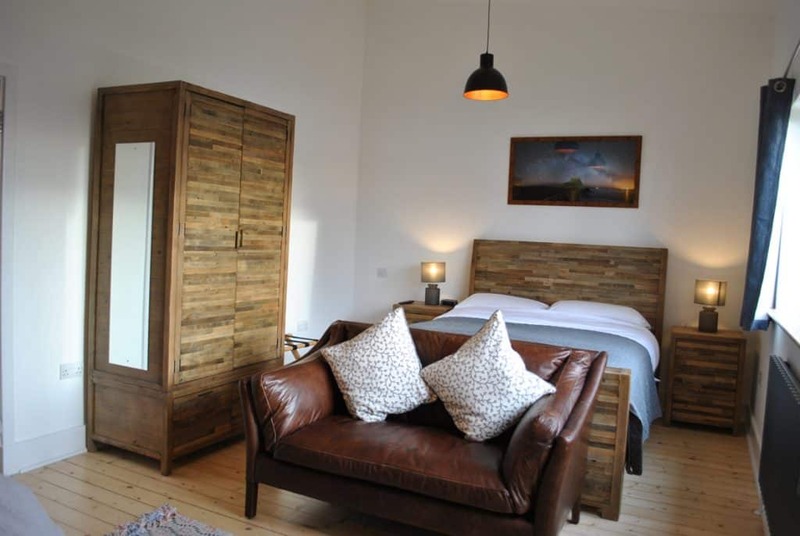 The room has a wooden floor and the bathroom floor is tiled with underfloor heating. 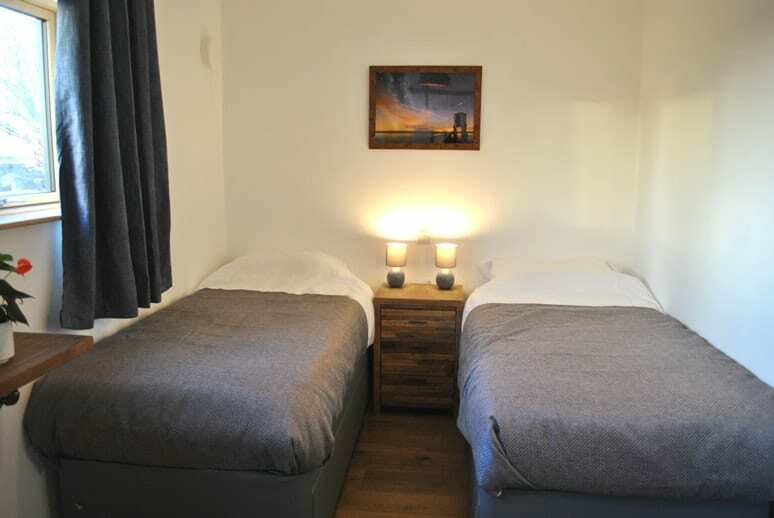 There are two small bedside tables between the beds with an LED alarm clock and bedside lamps. There is a shelf with kettle and coffee/tea-making supplies and an open rail for hanging clothes. The main room ceiling light is operated via a dimmer switch at the entrance to the room and next to the beds. There is room for suitcase storage under the shelves and at the end of one of the beds. The TV hangs from the wall with a movable arm to allow a comfortable viewing angle. The TV is operated via remote control. There is a cordless kettle, and coffee/tea making tray. Heating in the room is controlled by a timed smart control that can be adjusted at the radiator valve. 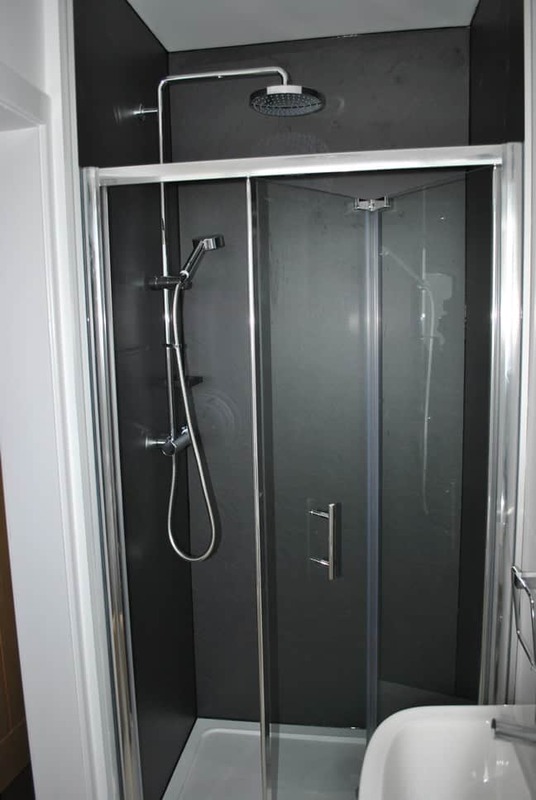 The dimensions of this room are 180cm by x 110cm, excluding the shower enclosure, which is 100×76 cm, non-slip. Entrance to the shower enclosure is via a concertina door. 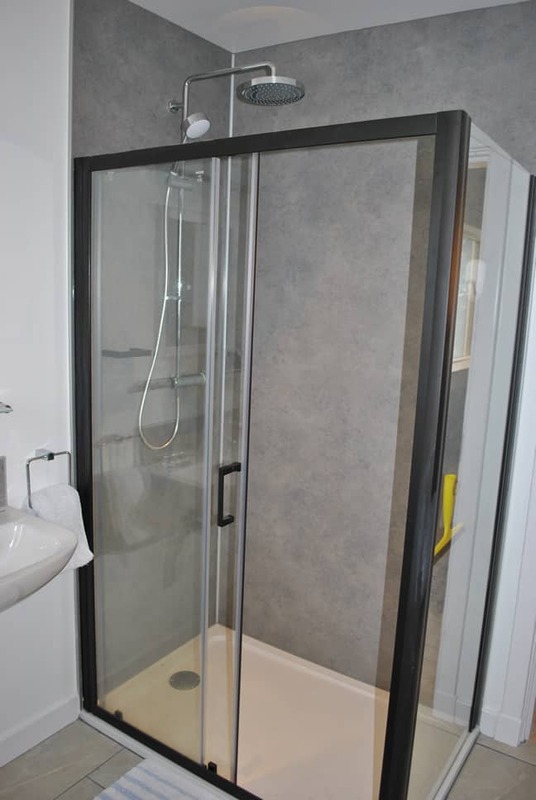 There are no support handrails in the enclosure, and because of the concertina door, it is impractical to have a shower seat inside the enclosure. The shower tray is a 7.5 cm step-over frame from the tiled bathroom floor. The bathroom floor is tiled with timer-operated underfloor heating. All guest rooms are fitted with inter-connected fire alarms with battery backup. All rooms are fitted with fire doors with a 30 minute rating. Guest room fire doors lead to the hallway which in itself was designed as a 30 minute rated fire enclosure. All rooms are ground floor (the Abbot Studio is elevated by four steps) and accessible to emergency services via ground-level windows. We recommend that guests notify us of any disabilities that may affect their mobility in a fire, or hearing impairments that might affect their ability to notice alarms. Any guests with concerns about their ability to leave the building in the event of a fire should contact us to discuss their specific needs. Lindisfarne Priory: access information from English Heritage. Lindisfarne Castle: access information from the National Trust.